Via SkypeKit Runtime using SkypeKit SDK wrapper. Is Ruby wrapper missed? No more! Thread stuff are completely on C side. Synchronous program is easy to debug an test. SkypeKit gem works in Ruby. 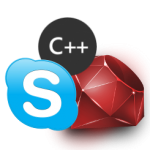 SkypeKit gem works in jRuby! It’s possible to quickly implement SkypeKit in Perl/Python/lua/etc. puts "Congrats! We are Logged in!" Now you can play with it. Libskypekit and Skypekit gem are both released under the MIT license.But SkypeKit SDK is not!Please carefully read SkypeKit License Agreement.There are a lot of restrictions!